We loaded everyone up into the van to return back to our old faithful hospital Mass this morning but didn't even get to the end of our street before Simon realized the car was leaning way back and to the left thanks to a totally deflated tire. So ... we all piled into the Jetta clown car style to go to Mass just a few blocks away .... but not before taking a detour for some pictures. As expected, the church was packed but we found half a pew to occupy just as the kids pulled out and secured their naughtiest hats. There was a couple sitting behind us and I'm fairly certain she was pregnant with her first and I think Sebastian inspired them to go purchase multiple books on how to discipline spirited (euphimism for "brat", much?) children. Julia cried the biggest crocodile tears for her blankie and her crib and repeatedly announced that she, "not wike Jesus" for the first 15 minutes and Theo was mostly okay. Despite getting up insanely early I still only managed to pull on the first wrinkly things I saw on the floor of my closet after wasting too many minutes looking for something that would sort of fit Theo and not scream "pajamas!!" but I think the new shoes that my awesome sister-in-law let me have helped my frogfit a little tiny bit. Happy, Happy Easter to you and yours (and a very happy birthday to the beautiful Ana!) Can't wait to see everyone's outfits. 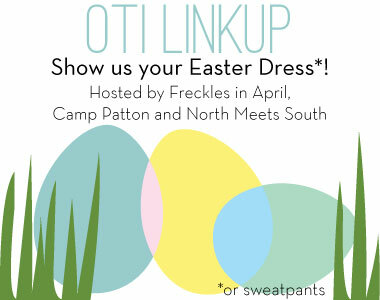 And if you don't want to dedicate a whole blog post -- feel free to go the Twitter or Insta route with #easteroti. Thanks in advance for linking up! Don't forget to go see what Kayla and Erica cooked up in their necks of the Net. It gets better - John Paul, at an elderly 3.5, couldn't care less about me (or most people, except for the babies, whom he has renamed "Pontius Pilate" and "soldier"). But you all still look adorable - I love how Julia has accessorized her dress with Woody :P Happy Easter! Ohhhhh and that picture of you and Julia is so beautiful! Blow it up and frame it! Love the way Theo is smirking at your attempts to corral Julia. Grace, y'all look lovely. My daughter has the same cardigan as Julia, and it's a fave. It seems to stretch so she's worn it for years now. Happy Easter! You have a beautiful family. Happy Easter! Happy Easter to you too! Everyone looks fabulous! I'm glad Simon was off and able to go with you! And I learned yesterday Dora Bandaids are worth their weight in gold in the toddler crowd! Grace, you look beautiful! I love how you have a weekly mass grade for your kids. It is awesome and I think they will love reading it one day :) haha! Thank you for the b-day shout out! You're the sweetest. Grace, you look so thin! And your family is so handsome. Happy Easter! The first and second pictures are such keepers — frame them!! Love the family photos, especially since woody made the cut! You must have had a very nice no-cancer iodine-filled weekend. I'm so happy for you! I love the green! Those Target pencil skirts are great. And such a beautiful family pic! What a great family pic and also the first one of you and Julia. I luuuurve your green and pearls! So classy =) Beautiful family! Happy Easter to my favorite blogger named Grace. Or blogger, period. Such a cute family picture, and the monochromatic outfit looks great! Happy Easter! OK...I am absolutely LOVING the photo of you and Julia. Just beautiful. Frame that one. You'll want to be encouraged on those days when she doesn't like you so much. LOL! Love the green. You should wear that shade more often. Basher in plaid is awesome and how fab that you actually got a family photo with everyone in it. That is a feat my friend. Happy, Happy Easter to you and the ones you hold dear. You all look so good. But honestly, what makes me happiest is Julia's Woody doll. If I wasn't supposed to be a grown-up now, I'd want one. Heck, I want one anyway. I love that picture of you and Julia! You look lovely in green, Grace! You might call it froggy, but I'm totally loving your green on green ensemble! Thanks for the link-up party! What a darling family! Love everyone's Easter look. SO enjoy reading your blog....as a new SAHM to a little girl born a few weeks before your Theo, you've entertained me through many a feeding and middle of the night stints. So appreciate and admire your perspective and humor! Hope you all had a happy Easter! All of the photos are framers! I especially love the one of you and Julia. Two beautiful and hilarious ladies, no? Happy Easter! Your outfit is perfect, as usual. And as usual again, Ryan and Basher were on the same Mass behavior wavelength. You've got to get Bash some of the invisibility sunglasses we got for Ellen. Quiet as a church mouse for the first half because she thought no one could see her. She is so smart. A- because he wanted to be held, classic :). ps. it took me all night and this morning to figure out what OTI meant! You couldn't have just blindly picked out that sweater and skirt off the floor...could you? They're too perfectly coordinated! Lovin' the gingham theme on the menfolk, including Woody. Happy Easter! As usual, you look gorgeous. And I'm must say that I'm a little envious that you just grabbed that from the closet floor. The stuff I grab from the closet floor is covered in cat hair and various and sundry stains. You look great in green, and I love the shot of you + Julia and that Woody made it into your family pics. Happy Easter! Grace, beautiful family! I'm impressed that you got a family pic. Period. I love that Julia has Woody by the neck. That is what was crumpled on the floor of your closet? Oh. Yeah. If I did that, I would have worn purple pajama pants and a dog-hair covered bathrobe. I bow to you! You guys look great! I love how everyone looks like they go together without matching! That picture of you and J at the top is the best picture ever. How do you guys look pretty with no-teeth smiles?! I can't do it. I love, love, LOVE that mother/daughter pic! I especially love that you two have the exact same expressions on your faces! I cannot get over how much I love your blog. The weekly behavior grades are too funny! That mother-daughter pic at the top is just beautiful. Whenever I get the "hands full" comment I reply with "yep full of good things"! Because I know even if it doesn't seem like it I know they are listening...and even if it doesn't feel like good things at that moment I believe deep down that they are blessings and not a burden! Now *that* is one smart looking family! (And Sheriff Woody is a nice touch.) Hope you are enjoying this Easter season!